PopMatters Features Radical's 2011 SDCC Lineup | Radical Studios, Inc.Radical Studios, Inc.
They’re a transmedia company, so they won’t be in it alone. 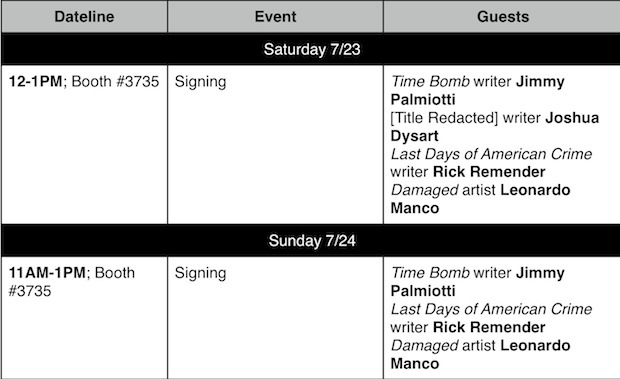 The genius artist Leonardo Manco will be there daily from Thursday (7/21) through Sunday (7/24). He’ll be sketching custom covers at every table signing. And he’ll be appearing at Radical’s panel with Full Clip Productions’ Sam Worthington and brothers Michael and John Schwarz. But that’s only the beginning of what Radical at Booth #3735 has in store. Radical brings the full weight of their transmedia interests to bear on their [panel, including] comics industry heavyweights David Lapham (the genius behind Stray Bullets and, more recently, the Radical/Full Clip collaboration Damaged) and Jimmy Palmiotti (writer on Time Bomb, architect behind the reboot of DC’s Jonah Hex), as well as the sublimely gifted Rick Remender, writer-creator of Last Days of American Crime. On center stage, though, will be Radical’s transmedia collaborative partnership with Full Clip Productions. 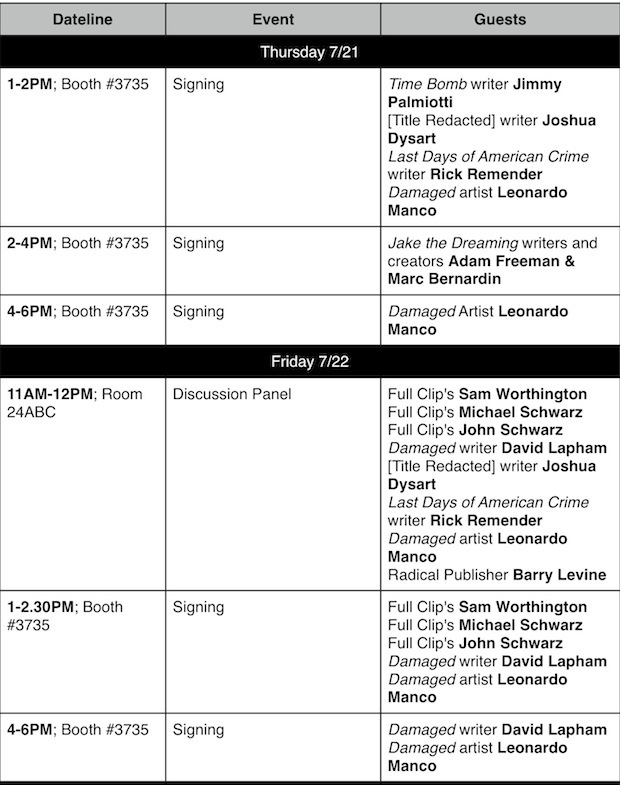 Friday’s panel in Room 24ABC will have Full Clip’s Sam Worthington (star of Avatar and the upcoming Radical Studios/Full Clip Last Days of American Crime), and Full Clip’s Michael and John Schwarz. Also on the panel will be Rick Remender, writer of The Last Days of American Crime, source material for the upcoming Full Clip/Radical Studios film of the same name (starring Sam Worthington). As well, Joshua Dysart (award winning writer for DC/Vertigo’s Unknown Soldier) will join the panel to announce his upcoming collaboration with Radical Studios and Full Clip Productions. But my secret highlight has got to be the chance to meet Adam Freeman and Marc Bernardin, creators behind the sublime Jake the Dreaming. Jake the Dreaming is the tale of a young boy who must confront the nightmares that haunt us all, as this is the duty of the Dreaming, who defends humankind while they sleep. Radical Publishing’s first illustrated novel, Jake the Dreaming is not only technologically groundbreaking, but fills the imaginative void left by the Harry Potter franchise’s closure. Here’s a handy timetable of Radical Publishing’s schedule. Find them at Booth #3735. Click here to go to the original article at PopMatters.